Blog: A Year in Jaffa. To which I shook my head defiantly, smiled, and said, "No, I'm strong." In Hebrew, the word la'alot has many different connotations. It means to rise up: you use it when talking about alighting on a bus, about climbing a hill, about achieving another level, about arriving specifically in Jerusalem, and also it is the word used to describe a Jew who has immigrated to Israel. The rationale for the later use is that by arriving in the holy land, your soul is rising up closer to a level of spiritual enlightenment and communion with God. However, the use of the word has by and large lost its religious meaning amongst day-to-day use when describing Jewish diasporic immigration to Israel. Three years ago, I made the decision to olah to Israel. My mother applied for my Israeli passport for me before I could walk—she took me along when I was only six months old to introduce me to the family—but my citizenship was not "active." My interaction with my Israeli citizenship was limited to the vague memories of standing in a different customs line at the airport in Tel Aviv than my dad who lined up with other non-Israelis. A few weeks before I turned 18, we were finalizing forms for my college registration and my mom suddenly said, "Oh! We should get you that exemption from the army!!" For a split second I felt the different life path if I had been living in Israel. Rather than going to college, with the glimmering nearness of independence and learning and new friends and adventures, I could have been entering the Israeli army. Yet, since I had grown up in the States, the idea was ephemeral and quickly brushed to the side; I never was called to serve. At age 19, I came to Jerusalem to study Hebrew for the summer on a grant from my college. It was my first time visiting my family in 6 years, my first time engaging with them as the young adult I was becoming, and my very first time able to connect with them in their own language and words. The summer was transformative; I felt deeply that I had found a place where I belonged. People looked like me, people danced like me, people were intense like me, and my heart felt full to finally be in the bosom of the tribe of our large, loud, and loving family. Having inherited my mom's dual-citizenship, I grew up with a foot in two different places. I was seeking to unify the pieces of our lives and our families. Since that summer, I continually tried to find ways to come back for extended periods of time: another summer on a grant to study Zionism, another winter studying Hebrew, and finally my MA studies in Jerusalem. Each time I visited, it felt like more than a visit. The place spoke to my bones, there was something there that I was supposed to learn, connect with, and do. Life in Israel is in high-definition; it's almost as if living in the US had been 2-D and Israel was 3-D; colors are brighter, tastes are more tasty, every day feels filled with meaning. I felt like I was finally awake and truly living. "Are you going there to become a part of the system, or to change it?" I responded, in a burst of tears, "To change it." So, June 2014, I packed my bags, held onto my immigration papers that claimed my status as a "returning citizen" and I “rose up” to Israel. I was welcomed as a new immigrant, an olah hadasha. My life the first few months was preoccupied with making sure my aliyah was smooth and daily struggles with Israeli bureaucracy: opening up a bank account, sorting out taxes, applying for health insurance. Then, only a few weeks after my arrival, the war with Gaza began. The summer was traumatic for me—both in experiencing violence, war, and death up close and also in suddenly feeling a deep rupture with the State of Israel. For so long, I had wanted to move and be a part of the culture, the society, the citizenry. And yet, suddenly I was faced with a situation (in my mind) of unjust retributive violence surrounded by a populace that was frightened and unable to encounter the humanity of the "other," and ineffective politics that used that fear to justify actions and atrocities. That rupture was painful, beyond what I was able to admit for many years. It pushed me to want to pack my things and leave. I felt lost and alone. Then, in January 2015, I went to the West Bank for the first time on a tour with Extend. I walked through the ghostly quiet streets of Hebron where Palestinians are forbidden to live or even walk, I met the activists of Nabi Saleh village and held rubber bullets and used tear-gas canisters in my hand, I held the green-identity card of a Palestinian man who shared his story with us and explained the ways that green card limited his movement and freedom to breathe. I learned about the intricacies of military law and courts and the daily occurrence of children being arrested: I heard how occupation is not just about occupying a land, but occupying the minds of a people. My life went from 3-D to being 4-D. I reconnected with the reasons I had come to Israel beyond family and belonging. I came motivated by a belief that human connection overcomes walls, that seeing things for yourself challenges your assumptions and leads to space of authentic learning and transformation. Hearing the personal story from a person is powerful, and learning to hear stories, in their original language, became an important part of my life. I had found my purpose. I connected with a community of local activists; I was challenged to think differently, to see differently, and to step outside of my comfort zone. Everything shifted then. I felt challenged and had much to learn, and learn I did. I am currently sitting on the plane and typing this entire post on my phone as I head back to the United States. I am leaving now because I reached a point where I feel, yet again, that I have so much to learn. I am leaving Jerusalem because I am starting my PhD focusing on the impact of conflict on female political agency at the University of Denver this September. This path of studying is a continuation of the conversations that began in Israel and Palestine, and I am excited to return one day with more tools and new frameworks to challenge what we think to be true. The movement is only beginning to grow now, the seeds have been planted and I am excited to see what it will grow into next. Was it a hard Aliyah? Yes. If I learned anything from these years living in Israel and Palestine, it is that. [Here are photos that I took over the course of three years, featuring my view of that Country of Contradictions]. Even after over a year of living here, I find myself wandering around the Old City of Jerusalem with eyes wide open, absorbing all the sites and sounds and smells of this contested and beating heart of Jerusalem. My feet find their way over the familiar stones and roads, but with the curiosity and knowledge that there will always be corners of this walled-in area that I'll never see and never know. As I was walking down the main road that connects Zion Gate to Damascus Gate in the heart of the Muslim quarter, I was struck by this feeling. Surrounded by shop-owners coaxing me to buy t-shirts with either Israeli or Palestinian flags, Arabic music floats towards me on wafts of incense from a Christian shop, Palestinian mothers herd their children into a shop to buy ful and hummus, and suddenly I was overwhelmed by a large group of Christians from Africa. They were clapping and singing and wearing bright, printed, purple cloth wrapped around their bodies and crying out for their lord and savior Jesus Christ. I stepped to the side of the narrow road to let them pass, and in that moment an Ultra-Orthodox Jewish man on a bicycle tries to make his way straight through the crowd—payot flying in the wind. 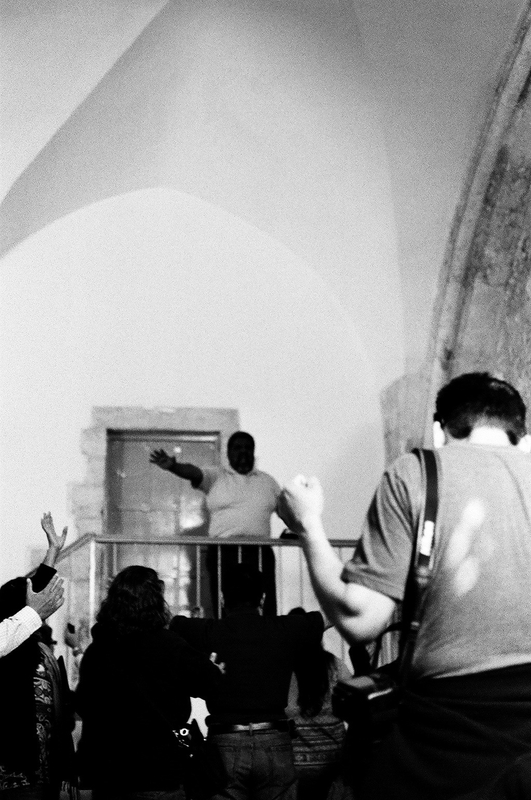 This is Jerusalem: so many different cultures and groups interacting in such close quarters. I've designed a tour of the Old City for the friends who come visit; it is mainly organized around food and my favorite corners. We walk through Damascus Gate and the Muslim quarter, grab date ma'amoul cookies from the vendor whose cart sits right under the arched entrance way, stop to sit in Jafaar's for the best knaffe in the city (an insanely delicious Arabic pastry that combines salty cheese and sweet syrup), and a walk through the Church of Holy Sepulcher where we see pilgrims sobbing over the rock where Jesus was said to have lain. I point out the Mamluk architecture, the water fountains of Sultan Suleiman, and the stone Crusader motifs that have been reused and incorporated into new constructions before we stop at the Austrian Hospice to enter an old-school European, Imperialist oasis and eat Apple-strudel. We then wander our way to the Kotel (Western Wall) and stare stupefied at the large and divided crowds of Jewish men and women pushing their way in the plaza for access to the ancient stones. We always attempt to get up to Haram al-Sharif (Temple Mount) and see al-Aqsa Mosque and the Dome of the Rock where Muslims lounge around under the shade of trees and the gaze of soldiers, but the hours are sporadic and often we miss the moment to take in the intricate mosaics. I then lead the way back up the hill to pass through the gift shop of the Institute of Temple Studies (where an organization has founded the construction of all the necessary accoutrements for the Third Temple according to the specifications in the Bible. You can buy a build your own Model-3D Third Temple kit). After being overwhelmed by so much belief, I drag tired friends straight to my favorite corner near Zion Gate: Dormition Abbey with the tomb of Mary, and David's Tomb. The Dormition is, I claim, the most feminist corner of Jerusalem. In the basement there is the crypt, where a statue of the Virgin Mary seems to be asleep, her face looking up towards a giant mosaic of Jesus’ face. Yet surrounding his image, and her sleeping space, are mosaic portraits of every woman character of the Bible. In this quiet, cool basement, away from the heat and the crowds, I always find a sweet moment to catch my breath and give my dues to the women who are often overlooked in these grand narratives. David’s Tomb is, again, a tiny corner of Jerusalem where you see the overlapping of worlds. Located right outside the exit of Zion Gate, this small building houses a different story on each floor. The ground floor supposedly has the tomb of King David, and has become an important site of pilgrimage for Jews. Local religious Jews come daily to pray at the feet of the Biblical King. The second floor is supposedly the site of the Last Supper which was converted into a mosque under the Ottomans. I’ve often stumbled upon large Christian tourist groups experiencing a moment of religious ecstasy with the mihrab pointing out the direction towards Mecca behind them. Then if you climb a flight of stairs and stand on the roof, the minaret and dome above the building tell you that the entire building was once a mosque under the Ottoman Empire. The experience of climbing the stairs and walking through different rooms and levels of narratives without ever leaving a ten-foot radius is always astounding. It begins to make you question the idea that Jerusalem could be divided under different authorities—how do you divide three different floors of one building? I once had a tour guide who used to be a security guard for one of these apartments. He led us through winding paths deep in the Muslim quarter where I had never been before. He shared that the experience was harder than when he had been in the army. They were required to accompany the residents anywhere they went when they left the building complex and faced constant threat from the Muslim neighbors who did not want these families living there. As he double-checked that the magnetic lock of the door had slammed behind us, he said he has never feared for his life, until he began working there. He quit after only half a year; the experience was too trying emotionally, mentally, and physically. He opened a door, and led us onto a rooftop with an incredible view of the entire Old City and the sparkling gold Dome of the Rock. The Old City is used as a focal point for the Israeli-Palestinian conflict, and often it simplifies the history into just a fight between religions. I always shy away from this conclusion; I don’t think it is correct to say that this is just an age-old story of Jewish and Muslim tensions. Such a conclusion overlooks the very vibrant and intercommunal relations that existed between these communities, and that still exist today. Simplifying the conflict of national determination and geopolitical context into a religious battle of will also overlooks the nuances of the narratives of the many groups who live here and have lived here before. Religion may play a role in the problems that are impeding a solution or that pour oil on an already simmering fire, but this ignores the historical contexts. The Old City is a never-ending experience of many different realities and narratives. I've heard rumors of secret networks of tunnels that connect the monasteries of monks, and I wouldn’t be surprised. That would add one more layer under our feet to this multi-layered place. The illusion of insecurity? Or the delusion of security? "It's fine until it's not fine." This sentence has been echoing in my head for a long time now. Especially when it comes to walking through neighborhoods I'm "not supposed" to be in, or villages I'm "not supposed" to see, or people I'm "not supposed" to meet. Riding home on the bus last week, our entire way was detoured as the road was blocked. Stones had been thrown at the light rail station by Palestinians in the neighborhood Shuafat, police were looking for the people who had done it. But that moment of seeing the red tape across the lampposts and the flashing lights, my heart was in my throat wondering what had happened. How bad? To whom? Meanwhile, up North sirens blasted warning the incoming of a possible rocket, and people were told to go to shelters. Only to be alerted minutes later that it was a false alarm. Twitter is a tricky flirt to follow. Or everyday I take the bus into university, the bus stops as a security guard climbs on the bus to walk down the aisle to "inspect." By inspect I mean, it generally is the same tired looking woman with her hair in a messy ponytail and chipped nail polish, headphone playing music into one ear, who walks up and down, glances at people's faces and somehow gives the nod that it's okay. We then get off the bus, pass through metal detectors and a check of our student IDs before being ushered into the university. I've begun thinking about the implications of these daily checks and these accidental sirens or the intensive double screening at the airport that my non-Jewish friends endure before flying. Our emotions are hijacked and kept in a state of fear and insecurity. I wonder how much of these security measures are actually necessary versus how much of it is perceived as necessary. These fears aren't rooted in complete disillusionment though. I am also aware that I am here at a time of relative calm--it's not the 90's or 2000s with the Intifadas and buses and restaurants blowing up in Jerusalem. My Jerusalamite roommate told me of the time she was in her room and a molotov cocktail was thrown through her window. She only lives in apartments now that have metal bars on the windows. There have also been many attacks on Israelis in the previous days (see last post here) as well as several Palestinians who have been seriously wounded or killed. The situation while "calm," is not fine. Yet I go to school and make dinner and see friends and buy toilet paper as normal as can be. This live on the edge mentality, that everything is fine until it's not fine, dictates life here. Limits people, pushes other people to extremes, highlights tensions, makes it hard to sleep. I had a conversation with my cabdriver one day and he threw his hands in the air when I mentioned something about politics and just said, "Everyone living here has high blood pressure. We are all sick. This needs to end so people can just live." Conflict is real. Something that I have to keep reminding myself as I take a deep breath. I met Manel Tamimi while traveling through the West Bank in January. She welcomed us into her home in Nabi Saleh and spoke with us about the horrors her family faces under occupation. Nabi Saleh is a well known friction point for resistance and holds weekly protests every Friday. The village organizes itself and attempts to walk from their homes across the valley to the spring that used to belong to them. The spring is now a part of the settlement which was built above it. 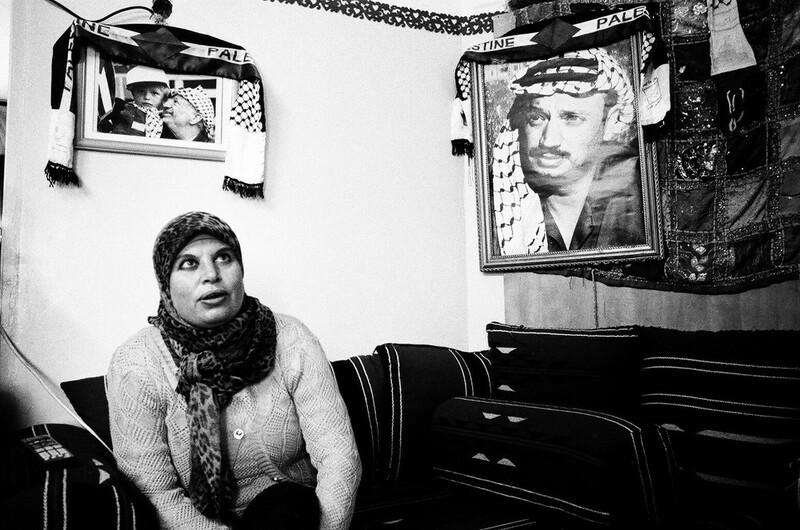 There’s a brilliant profile in the New York Times that describes the Tamimi family and the village. Manel was shot by an Israeli soldier in the leg today with live ammo during the weekly protest. There is weird parallelism in being here in Israel, on my way to the Kibbutz which was founded in 1953, to be surrounded by cousins and tradition, and to know at the same time that across the wall, not so far away, people are hurting because of this claim to this land. Riding the buses has become a bit of Russian roulette lately. Coming home yesterday from the university, which is located right on the border with East Jerusalem, I had to make a choice. Do I take the 19 which goes right by the Old City and will probably be delayed or re-routed due to the current clashes that have erupted over the occupation and access to al-Aqsa mosque? Or do I take the 34, the slowest bus that winds and curves it’s way through the ultra-orthodox religious Jewish neighborhood where everyone is black-hatted and walks in front of buses without looking knowing that their life is in God’s hands? I made the right choice, as the road for the 19 was completely closed with police standing guard. As I stared out the window at religious women pushing their strollers and gaggle of children across the street, I read online about the latest attack on the train stop. An Israeli died. He left behind his wife and 3 year old, he was also a Druze. Things are taking a turn for madness (more than the usual dose of crazy you find here). But it’s more than just random violence, it’s rooted in a context of oppression and disenfranchisement. Just this week alone, 2 Palestinian houses were demolished in East Jerusalem, 188 Palestinians were arrested in the last 2 weeks, a 5 year old girl was run over by a settler in Hebron, and there was an announcement for an expansion of settlements and a building permit for 500 more houses in Ramat Shlomo. Limiting access to al-Aqsa has just been the match to the fire. No one seems too sure what direction it will take. Some say third intifada, some say it’ll simmer down. But for now, I’ve begun to feel a different sort of pressure. Which bus do I take to get home? Jerusalem is coming to Denver! I respect your privacy and will never distribute your personal data and information. These photos search for the visual similarities that exist between subjects that are situated on opposing ends of the political, religious, economic, and ideological spectrums of the Israeli-Palestinian Conflict.